This classic text, originally published in 1948, is a study of the public administration movement from the viewpoint of political theory and the history of ideas. 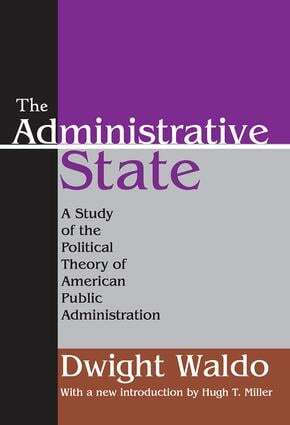 It seeks to review and analyze the theoretical element in administrative writings and to present the development of the public administration movement as a chapter in the history of American political thought.The objectives of The Administrative State are to assist students of administration to view their subject in historical perspective and to appraise the theoretical content of their literature. It is also hoped that this book may assist students of American culture by illuminating an important development of the first half of the twentieth century. It thus should serve political scientists whose interests lie in the field of public administration or in the study of bureaucracy as a political issue; the public administrator interested in the philosophic background of his service; and the historian who seeks an understanding of major governmental developments.This study, now with a new introduction by public policy and administration scholar Hugh Miller, is based upon the various books, articles, pamphlets, reports, and records that make up the literature of public administration, and documents the political response to the modern world that Graham Wallas named the Great Society. It will be of lasting interest to students of political science, government, and American history.